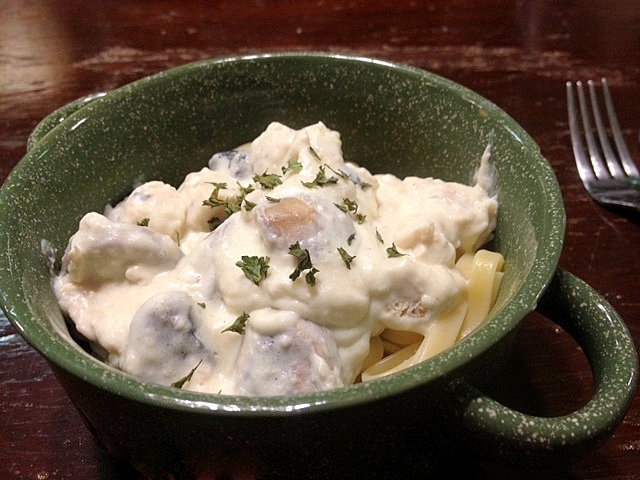 Chicken Alfredo is one of my husband's favorite meals! He orders it almost every time we go out for Italian food. I have only made Alfredo for him twice since we have been married. Both for special occasions. Usually when we decide to eat Italian I make lasagna, stuffed shells, or spaghetti. This time I made this dish for Valentines dinner and it was a big hit! I'm not even that big on Alfredo but this was pretty delicious! - Boil the chicken until done. Cut into small chunks and set aside. - Saute the mushrooms in 1 tbsp butter and 2 cloves minced garlic. Set aside. - Meanwhile, in a large skillet, melt and stir 1/2 c butter, cream cheese, milk, parmesan cheese and 2 cloves minced garlic until thick and creamy. Add chicken and mushrooms. Delicious! One of our favorites!